This is a sponsored post written by me on behalf of 7-Eleven Franchising . All opinions are 100% mine. 7-Eleven (aka our favorite spot for slurpees!) 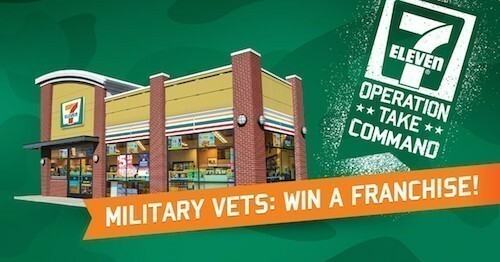 is giving away one franchise to a veteran through a contest called OPERATION: TAKE COMMAND. The contest launched on Veteran's Day and will run through January 25, 2015. Personally, I think our U.S. veterans are perfect candidates for a franchise opportunity. I know my husband, who is currently active duty, US Army, is always talking about one day opening our own franchise. It's something that he feels would be a great investment, especially if it were in the right location. 7-Eleven has an impressive relationship with the veterans in our country. The current President and CEO of 7-Eleven, Joe DePinto, is a veteran himself! The company was voted Best for Veterans Franchise and in the past four years alone 203,890 new veterans and military spouses have started franchising careers with 5,608 veterans becoming franchise owners. In the past year, 50,000+ vets have found employment in the franchise industry. What impressive statistics! Our veterans deserve amazing careers after their time in the military is over, and franchising seems to be a steadily growing option. With the leadership skills obtained from a military career, veterans can smoothly transition into franchising along with the extensive training support from franchising pros. Startup with 7-Eleven is fast (3-6 months) and they're with you every step of the way. Even better, this franchise opportunity is turnkey - meaning they provide the store, land and equipment. 7-Eleven also offers a gross profit split so they're truly invested in your success! Best of luck to all deserving vets. We salute you! Thanks to 7-Eleven for not only supporting our troops, but also truly investing in them! Thanks for sharing about this great opportunity for our veterans! Noone is more deserving.